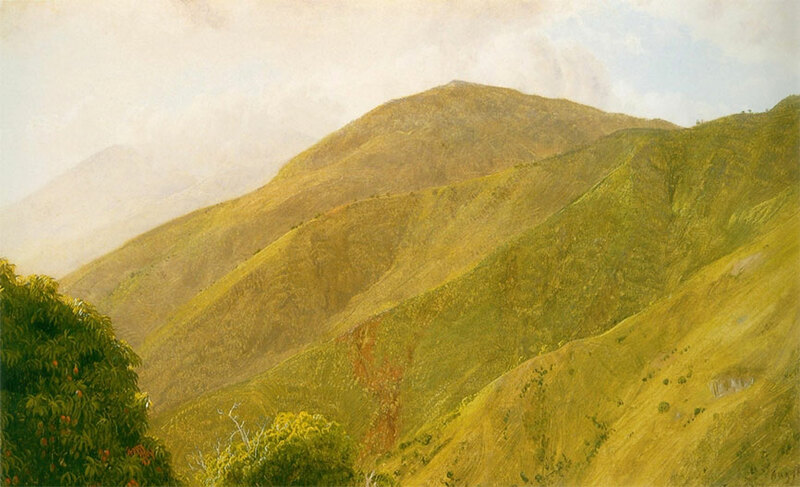 In 1865, Frederic Church, an avid traveler with a special passion for the tropics, journeyed to Jamaica. This was unlike his previous expeditions, as he and his wife, Isabel, were escaping from intense personal grief: the loss of their two young children. Throwing himself into the exploration and documentation of the island, the renowned artist produced a variety of works ranging from delicate pen sketches of palm trees to oil sketches of the atmospheric Blue Mountains and brilliant sunsets. The importance of the trip is reflected in the number of studies Church chose to mount, frame, and display at Olana, which became a major attraction for visitors to his home. The best of the related sketches and paintings from Jamaica comprised the exhibit. We thank the following for their help with this exhibition: New York State Governor David A. Paterson; New York State Office of Parks, Recreation and Historic Preservation Commissioner Carol Ash; Deputy Commissioner for Historic Preservation J. Winthrop Aldrich; Regional Director, Taconic Region, Jayne McLaughlin; and at Olana State Historic Site, Site Manager Linda E. McLean and Interpretive Programs Assistant Carri Manchester. We are also grateful to The Olana Partnership staff members: Curator Evelyn D. Trebilcock; Associate Curator Valerie A. Balint; Librarian/Archivist Ida Brier; Curatorial Interns Alexandra Anderson and Danielle Swanson; President Sara Griffen; Vice President for Development Robert Burns; Director of Administration and Public Affairs Nelson Sterner; and Executive Assistant Mary Curran. For providing their thoughts on Church and his fellow painters in Jamaica and the tropics, we thank Elizabeth Mankin Kornhauser and Katherine E. Manthorne. We appreciate Anthony Johnson’s lovely foreword, where he shares his perspective on Church, Jamaica, and the wonderful ferns that inhabit his island. For managing the loan and preparing the paintings, photographs, and printed material for display and photographic materials for this publication, we are grateful to the New York State Office of Parks, Recreation and Historic Preservation Peebles Island Resource Center staff: Acting Director for the Bureau of Historic Sites John Lovell; Director of the Division for Historic Preservation Ruth Pierpont; Collections Manager Anne Ricard Cassidy and her staff Erin Czernecki, Ronna Dixson, and Mary Zaremski; Former Curator Robin Campbell, Curator Susan Walker, and Assistant Curator Amanda Massie; Paper Conservator Michele Phillips; Frames Conservator Eric Price; and Paintings Conservator Joyce Zucker. The accompanying catalogue, which serves to enlighten readers about the collections at Olana, the adventures of Frederic and Isabel Church, and the lure of Jamaica long after the exhibition closes, would not have been possible without early support from Henry and Sharon Martin; and the guidance of Ed Marquand and his staff at Marquand Books. For their continued support of Olana publications we are grateful to Cornell University Press, especially John Ackerman and his staff. We acknowledge Lory Frankel for her thoughtful editing of the essays and careful attention to the proofs. For supporting images we thank: John Benicewicz at Art Resource, New York; Jonathan Boos; Kayla Carlsen at Christie’s; Elizabeth Saluk at The Cleveland Museum of Art; Jacquelann Killian and Chuck Kim at the Cooper-Hewitt, National Design Museum, Smithsonian Institution; Fiona Bradley at the Royal Botanic Gardens, Kew; Richard Manoogian; Cheryl Robledo at the Manoogian Collection; Susan Grinols at the Museums of Fine Arts, San Francisco; Meghan Mazzela at The Museum of Fine Arts, Boston; Franklin Kelly, Deputy Director and Chief Curator, National Gallery of Art, Washington, D.C.; Eleanor Gillers and Jill Slaight at the New-York Historical Society; Private Collection; Chloe Richfield, Director, and Louis M. Salerno, Owner, Questroyal Fine Art, LLC; Mike Ramos; and Erin Monroe and Allen Phillips at the Wadsworth Atheneum Museum of Art. For contemporary images of Olana included here, we thank photographers Kurt Dolnier, Carri Manchester, and Nicholas Whitman. For their advice, support, and encouragement of the exhibition, the Sharp Family Gallery, and this publication, we want to recognize the Olana Curatorial Committee: Susan Winokur, Chair; Armin B. Allen; Stephen Edidin, Chief Curator, New-York Historical Society; Barry Harwood, Curator of Decorative Arts, Brooklyn Museum of Art; Mary Ellen Hern, Director of Development, New York State Historical Association, Fenimore Art Museum, and The Farmer’s Museum; Judith Hernstadt; Frederick D. Hill; Paul Leach; John Lovell, Peebles Island Resource Center; Linda E. McLean, Olana State Historic Site; Carri Manchester, Olana State Historic Site; Amy G. Poster, Curator Emerita of Asian Art, Brooklyn Museum of Art; Richard T. Sharp; Carol Irish Strone, Carol Strone Art Advisory; and Karen Zukowski, Independent Scholar. Finally, we wish to thank the generous individual and institutional donors that provided the necessary funds that have made this important book and exhibition possible: David Kabiller; the Lois H. and Charles A. Miller Foundation, Inc.; the Terra Foundation; Jack Warner Fund for Creativity and Innovation; and the Olana Exhibition Fund.